Following the Hempel Sailing World Championships in Aarhus, Denmark, the sailors are continuing their journey to the Tokyo 2020 Olympic Sailing Competition. Enoshima will welcome sailors in just under two years' time for the Olympic Games and for many, the World Cup will be their first opportunity to learn about the Olympic venue. Following the London 2012 test event in 2011, 17 medallists went on to clinch an Olympic medal, while at the Aquece Rio 2015, Rio 2016's sailing test event, 16 medallists achieved an Olympic medal a year later. The fleets in Enoshima feature many of the leading racers who will be aiming to reign supreme and set a benchmark. Eight of the World Champions crowned in Aarhus are racing and will be joined by more than 450 sailors from 45 nations. More than 30 Olympic medallists are also competing. The Men's and Women's 470 fleets will feature 32 and 23 teams respectively. 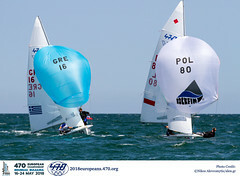 The 470 Men and Women fleets field a worldwide entry list of top talent from 22 nations around the world. World ranked #1 pairing of Mathew Belcher/Will Ryan (AUS) will be looking to make amends for the 470 World title they let slip last month in Aarhus, Denmark. As the most renowned sailor on the 470 circuit, Belcher, with crew Ryan, is looking to make his mark on the Olympic waters of Enoshima. Aiming to upset them though will be the reigning World Champions Kevin Peponnet/Jeremie Mion of France, who trounced the Aussies last month after a masterful play of boat speed and strategy. Amongst Japan’s top talent is 2018 470 Worlds silver medallists and world #3 pairing of Tetsuya Isozaki/Akira Takayanagi, who headline an eight strong team from the host nation. In the 470 Women, glory went to the legendary sailor Ai Kondo and her crew Miho Yoshioka at last month’s Worlds. With the added bonus of sailing on home waters, this partnership will be hard to beat. They teamed up just over 4 years ago and rank as medal favourites for Tokyo 2020. Three-time Olympian Kondo is targeting a fourth Olympic appearance at Tokyo 2020, but still has to beat a pocketful of young Japanese hopefuls aiming to claim the honour of being on the Olympic start line. Plenty of 470 Women’s talent up against these two, including Rio 2016 Gold Medallist Hannah Mills with Eilidh McIntyre (GBR). The British pair picked up bronze at this year’s 470 Worlds, just behind the outstanding young Spanish talent of Silvia Mas Despares, a former Youth World Champion, who is now partnered up with Patricia Cantero Reina. 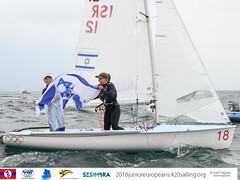 Rio 2016 Olympic Gold medallist Camille Lecointre of France took a year out after becoming a mother, and has returned to the circuit as strong as ever together with crew Alioise Retornaz, herself a two-time 470 Junior World Champion. So, plenty of talent to watch at the front of the fleet, and plenty of teams likely to make gains as the waters of Enoshima are renowned for throwing up curveballs in what will inevitably be a gruelling race track battle. Teams from the following nations are competing: Argentina, Australia, China, France, Germany, Great Britain, Greece, Hong Kong, Italy, Japan, Korea, Netherlands, New Zealand, Poland, Russia, Singapore, Slovenia, Spain, Sweden, Switzerland, Turkey, USA. Racing starts at 11:00 local time on Tuesday 11 September. The Men's and Women's RS:X, 49er, 49erFX and Nacra 17 competition will conclude on Saturday 15 September with their Medal Races and the Laser, Laser Radial, 470s and Finn will wrap up on Sunday 16. 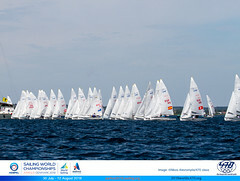 Both days will be available to watch live on World Sailing's YouTube Channel - www.youtube.com/worldsailingtv.